Invasive plant species alter soils in ways that may affect the success of subsequent generations, creating plant–soil feedbacks. Ailanthus altissima is an invasive tree introduced two centuries ago to North America. We hypothesized that geographically distinct populations of A. altissima have established feedbacks specific to their local environment, due to soil communities cultivated by A. altissima. We collected seeds and soils from three populations in the eastern United States, and in the greenhouse reciprocally planted all families in all collected soils as well as in a control mixed soil, and in soils that had been irradiated for sterilization. 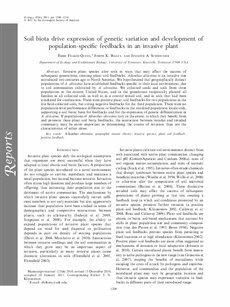 There were positive plant–soil feedbacks for two populations in the live field-collected soils, but strong negative feedbacks for the third population. There were no population-level performance differences or feedbacks in the sterilized population locale soils, supporting a soil biotic basis for feedbacks and for the expression of genetic differentiation in A. altissima. If populations of Ailanthus altissima vary in the extent to which they benefit from and promote these plant–soil biota feedbacks, the interaction between invader and invaded community may be more important in determining the course of invasion than are the characteristics of either alone.